The two day ceremony celebrating the arrival of the Lunda and Luba people to Zambia from Kola in the Democratic Republic of Congo, is held at Mwansabombwe village, the royal capital of the Lunda, on the last Friday and Saturday of July. The Mwata, paramount chief, opens the ceremony by performing traditional rituals at various sacred locations in and around the palace, paying homage to the spirits of his ancestors. In Nakabutula, a sacred hut in the palace grounds, he is smeared with Inkula, an ochre-coloured dust. Outside the western gates of the palace, the chief is smeared with Ulupemba, white dust, by the Lunde, the caretakers of the shrines of Chinyanta and Kasombola. The princes, Chinyanta and Kasombola, were two brothers murdered by drowning in the early 1700's. The ceremony continues with the Mwata pouring beer and throwing food into the Ng'ona River saying, 'What your fathers died for should follow you'. The Mwata returns to his palace to hold court with local chiefs, headmen and dignitaries before changing into his traditional costume, the Mukonzo, a voluminous skirt made with over 40m of cloth. He mounts the Umuselo, a litter of zebra skins, before beating a small drum to communicate with the ancestors. His is then raised up by the bearers and carried to the arena. As he passes through the palace gates a goat is sacrificed. 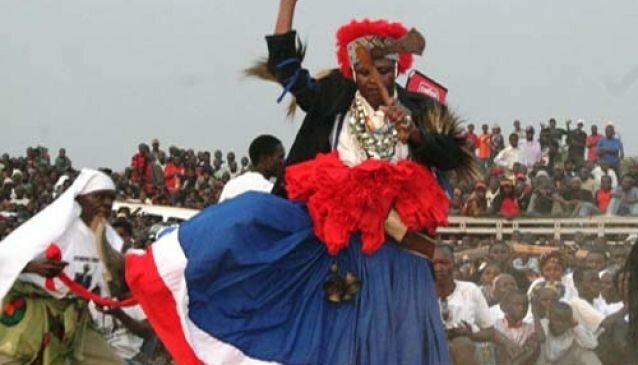 The day's events culminate in the Mwata performing the Lunda dance of conquest, the Mutomboko. The Mwata's assistant holds another piece of clothing, known as the Lucaca, and must keep up with the chief's dancing. As the dancing continues, the Mwata points his sword to the north, east, south, west and finally to the sky and ground, symbolizing that only God and death can conquer him. The ceremony concludes when the Mwata is carried back to his palace.